I don’t know about anyone else, but I can’t think of the phrase “Cats in Space” without hearing the lead-in to the old “Pigs in Space” skits from the Muppet Show. But, no matter. Since we recently did a literary blog about Cats in Science Fiction, it seems appropriate to do an astrophysics blog about Cats in Space, or at least cat images and symbols in astronomy. There actually have been cats in space, which we will get to later. But first, let’s look at astronomical features named after cats, beginning with some constellations. This is one of the really great constellations for urban star-gazers. It has many bright stars and actually looks something like the thing that it is named after – i.e. a lion. That would be the Nemean Lion that Hercules slew, as one of his twelve labours. This cat took helpless maidens to his cave, to lure warriors to their deaths, in their efforts to free the women. It was impervious to weaponry, so Hercules killed it with his bare hands. Zeus then put the lion in the sky to commemorate the deed, so we can enjoy Leo to this day. Or so the story goes. 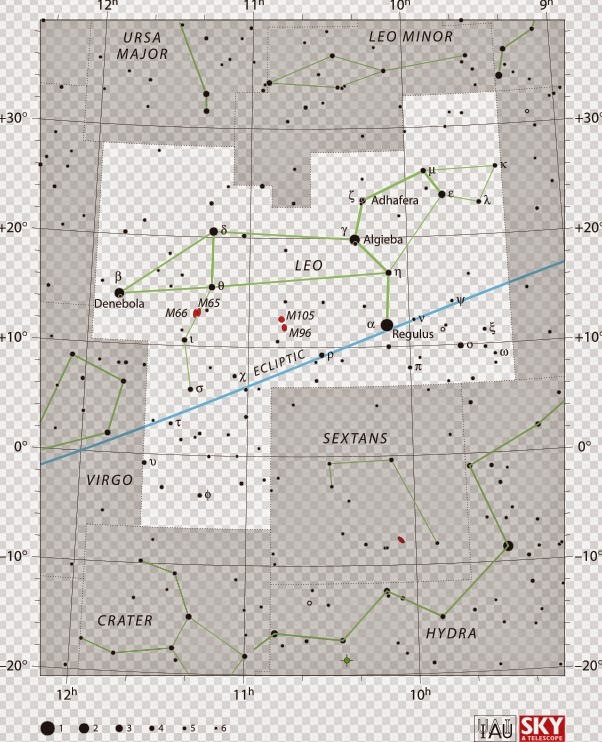 From my part of the world, Leo is best seen in the early spring evening sky, looking south, a little above the plane of the ecliptic. Clearly that will vary with latitude, though. It’s not too hard to envision it as a lion, or at least some kind of animal, as the constellation map shows. It has many bright stars, notably Regulus (think of it as the lion’s right foot) and Denobela (the end of the tail). There are also some nice double stars, that can be split in smaller telescopes. Gamma Leonis is a favorite of amateur astronomers. It also contains the small M-Class star, Wolf 359, famous in Star Trek history for the location of a decisive battle with the Borg. Leo also has several notable deep sky objects, especially the galaxies M65, M66, M105 and M96 (those are known as Messier numbers). Though they are quite bright deep sky objects, I haven’t had a lot of luck finding them from my city back yard. But they are pretty easy in a reasonably dark sky. The meteor shower known as the Leonids occurs in November, and appears to come from that part of the sky. That shower can be pretty remarkable. I recall seeing some amazing meteors in the early 2000s, including some that broke up in the atmosphere with a spectacular fireball effect. Note that since Leo is near the plane of the ecliptic, the planets sometimes pass through it, which can be useful for orienting observations. This one’s kind of a dud really. It is quite small, and its stars are all rather faint. Even in a dark sky, it’s pretty tough to make it out (it’s above Leo, if you can recognize it). It has some interesting galaxies, but you need a dark sky and a good telescope to make them out. There is no interesting mythology associated with Leo Minor, as it wasn’t designated until the late 1600s. This is another very faint constellation in the northern sky, without much to note about it. Supposedly, it was designated Lynx because you need the eyesight of a cat to see it. It does have an interesting globular cluster (NGC 2419), which is high above the galactic plane. 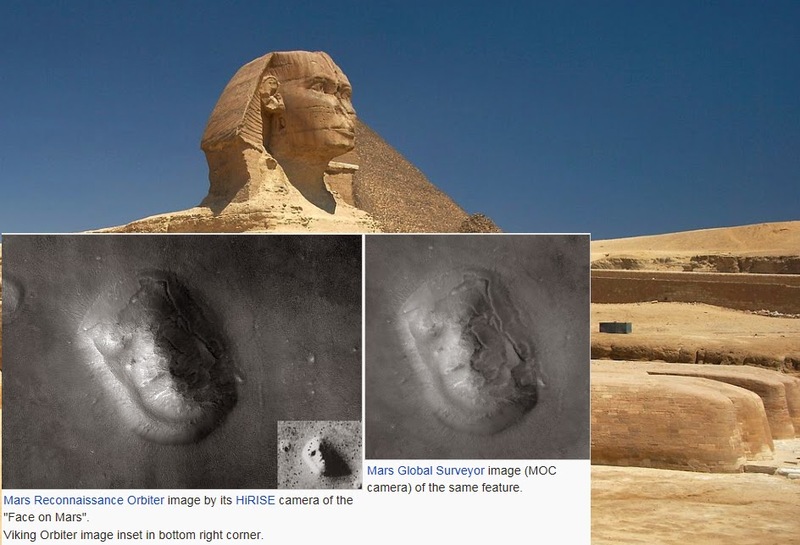 It is supposed to be findable in a reasonably dark sky with a medium sized telescope. This is a classic planetary nebular, and a very beautiful one, as you can see from the Hubble photo. The term planetary is a misnomer, given early in the history of telescope observations, as they look something like planets through a small telescope. It is located in the constellation Draco, high in the northern sky. In fact, it is very close to the north ecliptic pole, similar to how Polaris is close to the North Equatorial Pole. In other words, it is 90 degrees above the sun’s position. The concentric rings are actually bubbles of dust, produced by a central star that has ejected some of its matter, late in its life. The colours depend on the type of matter that is in each ring and some of the other structural features are probably related to magnetic fields. The sun might look something like this in several billion years, as stars in that mass range are thought to go through this stage. 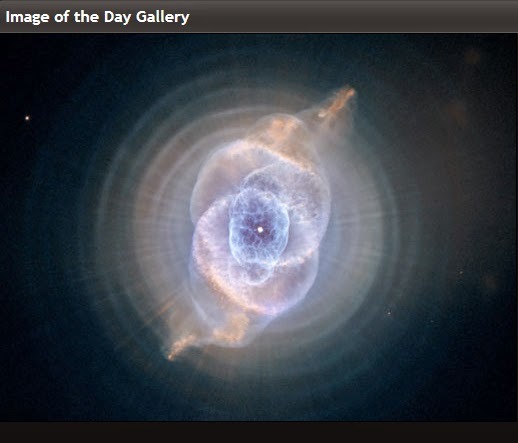 The important thing here, is that it does look rather like a cat’s eye. 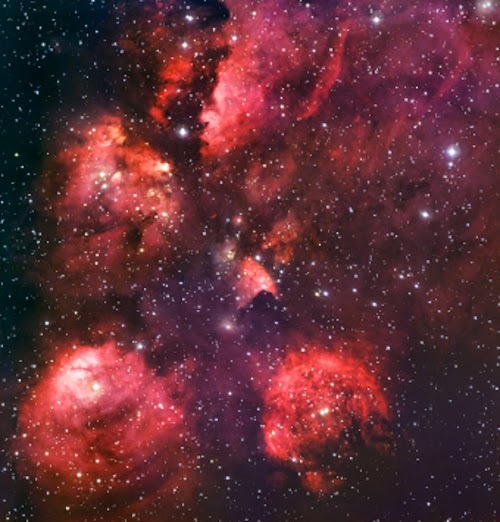 This is another spectacular nebula, in Scorpio. It is obvious why it is called the Cat’s Paw from the picture. In this case, the nebula is an emission nebula, similar to the Orion nebula. Rather than being an artifact of a star near the end of its life, it is in fact the birthplace of new stars. In fact, it is an extremely prolific birthplace, and may well be said to be having kittens. 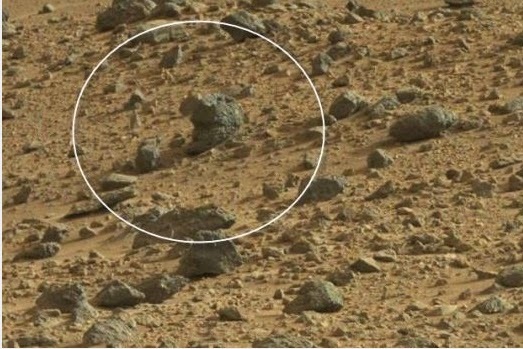 Also worth noting is the so-called cat on Mars, though I don’t believe any books have been written about it. It falls into that category we looked at earlier (pareidolia), whereby humans have a tendency to see familiar figures in random configurations of shapes. And since a Martian Cat obviously needs a food source, here’s another picture that someone discovered in the Curiosity rover’s archives. 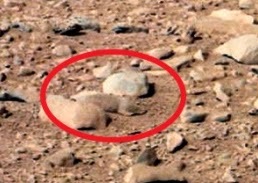 Yes, it looks amazingly like a Mars Mouse. 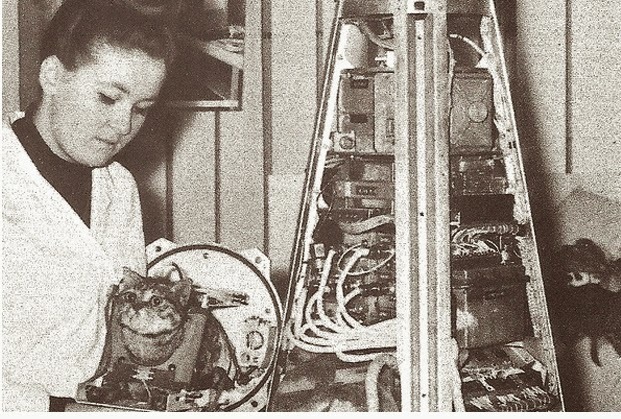 On October 18, 1963, French scientists launched the first cat into space on a Veronique AGI sounding rocket No. 47. The cat, named Félicette, was successfully retrieved after a parachute descent, but a second feline flight on October 24 ran into difficulties that prevented recovery. So there you have it – a comprehensive list of cat related lore concerning the sciences of astrophysics, astronomy and astronautics.